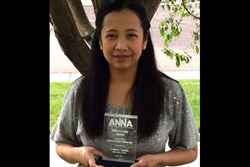 NaphCare, Inc., an independent leader providing proactive and comprehensive correctional healthcare and state-of-the-art technology, is honored to congratulate Leilani Castillo of Denver, CO for receiving the Quality Care Award from American Nephrology Nurses’ Association (ANNA). Ms. Castillo has worked with NaphCare since July 2007 and has served as the Unit Manager at the Denver Reception and Diagnostic Center in Denver, CO. Ms. Castillo was selected for this award from over 10,000 registered nurses and other health care professionals who are members of ANNA. The Quality Care Award is sponsored by Church & Dwight Co., Inc. and serves to “recognize a nurse or technician who, through clinical excellence and exceptional human compassion, has provided care to hemodialysis patients that is above and beyond the requirements of his/her position.” Along with a plaque commemorating this achievement, Ms. Castillo will be awarded $2,000. Ms. Castillo was selected because of her dedication to personal and professional growth through continuing education, involvement in patient care through patient education, and active involvement in nephrology nursing activities. The American Nephrology Nurses' Association (ANNA) promotes excellence in and appreciation of nephrology nursing to make a positive difference for people with kidney disease. They were established as a nonprofit organization in 1969 and have a membership of over 10,000 registered nurses and other health care professionals at all levels of practice. NaphCare is a governmental contractor supplying healthcare professionals and state-of-the-art technology for the delivery of budget-conscious correctional healthcare. To discover how NaphCare can provide cost-efficient solutions to meet your healthcare needs, visit naphcare.com.